Hyundai introducing Accent SR Concept at Frankfurt Motor Show Published: November 15th, 2005 With the new Hyundai Accent due to be launched next year, Hyundai Motor Company elected to make a detailed exploration of the emotional, high performance and high tech potential of the new model. The result is the Accent SR - a refined, exciting and forward-looking concept car which provides a fascinating glimpse of future possibilities in this class. 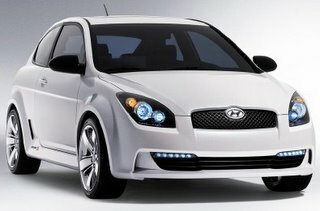 As a concept car, the Accent SR is significant in demonstrating a new approach by Hyundai to a high-performance market segment which it has not corporately entered in the past. The internal designation of the car is SR and the chassis, engine and styling take the car firmly into up-market grand tourismo territory. The Accent SR measures 4,035 mm (L) by 1,745 (W) and 1,470 (H). Integrated front, and rear roof spoilers, together with stylish deep sill side spoilers give it a distinguished and purposeful look. Much thought has been invested in the characteristic way in which the frontal treatment blends grille, headlight clusters, character lines and A pillars into a charismatic and powerful stance. The suspension is lowered and widened, and the car rides upon custom designed 18 inch alloy wheels with 225/40R profiled tyres. Extended wheel arches front and rear are unified by a strong shoulder line moulding, while side air vents draw cooling air into the rear wheel arches. The rear treatment, blending the roof spoiler into the rounded hatchback top, features an extension of the lower side sills on either side of the aperture bearing the twin oval tailpipes. The rear passenger windows are also upswept to meet and compliment the rear spoiler line, evoking some of the greatest GT cars of all time. The result is attractively modern, well-tempered, aggressive elements. The clear lines and highly succinct outline are further highlighted by the use of pearl white paint, complemented by clear glass, black bezel and aluminium cylinder light clusters both front and rear. Inside the Accent SR the sporting themes are carried even further. Plentiful use of stylish aluminium, metallic finishes and real leather add traditional flair to the appeal of the high tech fittings. Leather covered sports seats, door inserts and a leather rimmed sports steering wheel set the style for the driver. The instruments are prominently clustered and rear-radiation lighted for ideal driver visibility and readability. Aluminium pedals and inserts further add to the highly sporting ambience. The wraparound fascia includes an integrated 8 inch graphic display screen, and 3 USB 2.0 ports for multimedia use. The lighting in the central console and fascia is modulated by the use of high-glossy and matt black materials. Touch screentype controls activate electric windows, mirrors, seats etc., which are LED backlit for optimum convenience. A surround system of airbags introduces curtain airbags to the Accent range for the first time. The result is a powerfully impressive and fully unified interior, guaranteed to arouse the emotions of any committed driver. The new Accent suspension, featuring MacPherson strut front with new torsion beam rear suspension has been further refined and tuned for the Accent SR. The result is a chassis which can easily handle the unspecified, but high, power and torque output of the 2.0 Turbo engine for which the car was designed. 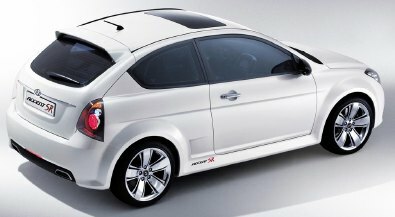 Transmission is via a 5-speed automatic gearbox. Technologically the car features, among other innovations, ESP, motor driven power steering (MDPS), and a tire pressure monitoring system (TPMS), which will almost certainly be carried over to the incoming new model range at various trim levels. 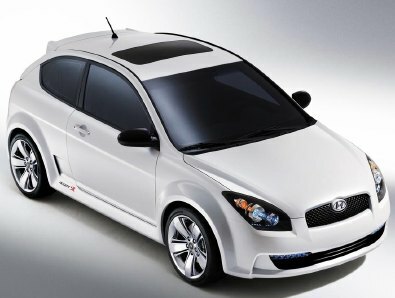 Commenting on the new technologies, Advanced Design Team leader at the Hyundai-Kia Corporate R&D Division, Mr. Baek said, “Although the Accent SR is not scheduled for mass production, various elements will certainly find their way on to the forthcoming Accent model. With our attention to detail, and to the sporting market, Hyundai have yet again displayed a willingness to explore niche markets. The Accent SR can be seen both as a styling exercise and a carrier of Hyundai’s future marketing philosophy, technology, design, and outlook. It is this spirit of willingness which has built Hyundai into a world recognised car manufacturer, one competent and ready to challenge in every market sector. source: allcarnews.com Always remember to visit for latest deals available Gary Rome Hyundai , Hyundai Accessory Store and Hyundai Performance Auto Parts.